"Monkey fist" redirects here. For other uses, see Monkey Fist (disambiguation). The monkey's fist is a spherical covering with six surface parts presenting a regular over-one-and-under-one weave. This weave is commonly doubled or tripled to present an appearance that superficially resembles a Turk's-head. Like the Turk's-head, the knot is tied with a single strand, but here the resemblance ceases. The Turk's-head diagram consists of a single line; the common monkey's fist diagram has three separate lines, which are best represented by three interlocking circles, in the best Ballantine tradition. To tie a knot on this diagram with a single strand, it is necessary to complete each circle in turn—that is, to double or triple it, as the case may be—and when this has been done to deflect the strand into another circle which is completed in turn before commencing the third and last circle. 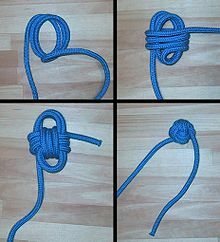 The monkey's fist knot is most often used as the weight in a heaving line. The line would have the monkey's fist on one end, an eye splice or bowline on the other, with about 30 feet (~10 metres) of line between. A lightweight feeder line would be tied to the bowline, then the weighted heaving line could be hurled between ship and dock. The other end of the lightweight line would be attached to a heavier-weight line, allowing it to be drawn to the target easily. tied using the same 3 step method as a monkeys fist but with only one turn (light version) or one and a half turns (heavier version) in the first step, most of the rope weight provided by the turns at the second step, and as third step threading the end through the nearest bight pinched by the turns at the second step and tightening. 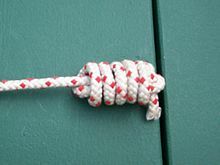 A monkey's fist can be used on two ends of a tow lines of one side a fish net which is then thrown from one trawler to another, allowing the net to be cast and set between two boats so the trawl can be used between the two, in pair trawling where the tow or catch is negotiated between both parties. This makes it easier to catch fish given the greater surface area between both boats to turn around and catch missed fish from the sea much more quickly. Once all fish have been hauled up from the sea, tow lines of the fish net is returned by way of thrown both monkey's fists back to the host trawler. Alternatively, a monkey fist can be used as a weight of a heaving line thrown to over to an opposing ship to bring two ships together. Monkey's fists are commonly used as a convenient and unobtrusive method of storing and transporting precious gemstones. A floating monkey's fist can be created by tying around a buoyant material such as cork or styrofoam. The three coils of cordage in a monkey's fist form in effect a set of Borromean rings in three dimensions. This is most obvious when tied flat. It is also the most common knot used in a pair for cufflinks where it is considered a "silk knot." Monkey fists have become popular as main deployment handles for sport parachute systems. ^ Ashley, Clifford W. (1944). The Ashley Book of Knots, p.353. Doubleday. ISBN 0-385-04025-3. ^ Board on Science and Technology for International Development, National Research Council (1998). "Fisheries Technologies for Developing Countries". The National Academies Press. Retrieved 2009-06-28. ^ Leishman, J. "Leg 1: Ft. Lauderdale to Bermuda - Across the Atlantic in 18 Trawlers." Sea Magazine, September 2004. Accessed 2009-06-28. Wikimedia Commons has media related to Monkey's fists. Look up monkey's fist in Wiktionary, the free dictionary.